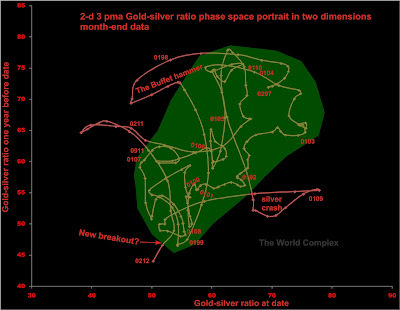 The World Complex: Gold silver ratio update--a new breakout? Gold silver ratio update--a new breakout? It has been awhile since we last checked on the phase space of the month-end gold-silver ratio. Here it is as of the end of March (I am using a three-point moving average and because of my past training I plot the result at the midpoint of the mav, which is why the last point is labelled 0212 instead of 0312). It is premature to call this a breakout, but I am looking for any reason to be optimistic about silver right now. If there is no decrease in the gold-silver ratio, then the current "breakout" will be short-lived, and will resemble the little excursion we had last year, which lasted all of ten months. I see a cartoon-like rabbit head at the top-right. He's leaning hard to the right and running, and his tail is curled tight to the upper-left. It looks more like a chihuahua to me. And you missed the Buffet hammer on the left.